Influencer is a free WordPress theme designed for blogger and coaches looking to increase their followings. The theme is great for building email list and a personal brand. The theme consists of elements that will help you to present you and your business in the best way possible. The theme is SEO-friendly, speed optimized and mobile friendly for the optimum user experience. Influencer WordPress theme is optimized for all types of screens of tablets, mobiles, laptops and PC. 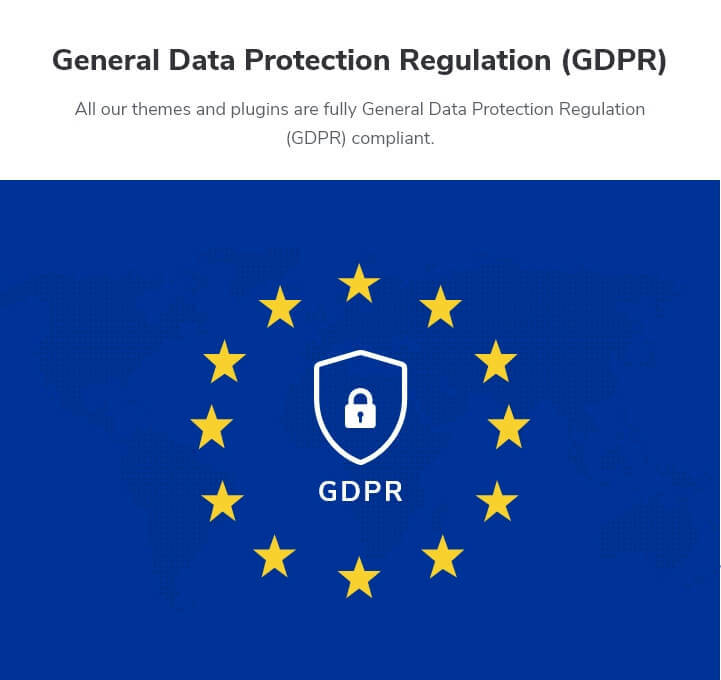 With more than 50% of Google searches being done on mobile phones, this theme is fully-responsive and is designed to adapt to any screen sizes. Influencer passes Google mobile-friendly test. This means better rankings in search results and better user experience. Schema friendly is an important ranking factor according to the Google’s recent announcement. Thus, we have added schema integration to Influencer which will help boost your website’s search engine ranking and have an edge over your competitors. 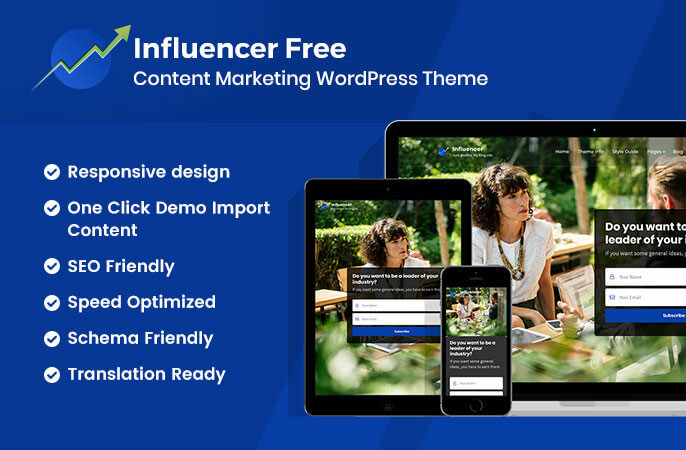 Influencer WordPress theme is a speed optimized, which means your website will load faster and your visitors will have a smooth browsing experience. The theme, with its speed, will help you keep your customers and improve engagement. You can import all the images, text, and settings from the live demo of Influencer theme with a click because we believe you should spend more time on your venture than on setting up your website. Influencer is built to improve your conversion and build your email subscription. The attractive banner section with the newsletter subscription is great way to grow your brand and newsletter subscribers. Blogs are a great way to attract new website visitors and built trust. Influencer has beautifully designed blog layout for your blog posts. Influencer comes with an extensive theme documentation to help you setup your website. Just follow the step by step guidelines on the documentation and your website will be ready in no time. We won’t charge you for using Influencer WordPress theme. And, there’s no catch! Influencer allows you to display your social media links on your website so that your visitors can find you on social media. Social media on your website will also help you boost your business’ engagement. The theme also supports Russian and Chinese social media like OK, VK, Zing, and others. You can add unlimited social media on your website. Influencer theme is fully compatible with WooCommerce plugin. You can easily create a platform to sell merchandises on your website. Influencer has ample space for widgets. You can add and manage the widgets you require without compromising the design of the theme. Widget ready design and code allow you to easily customize your website as you desire. Influencer is clean and has an eye-catching, modern design that will mesmerize your visitors. The theme will create a good long-lasting impression on your users. Influencer is cross-browser compatible, which means the theme will work seamlessly with the popular web browsers. The theme is tested with latest version on Chrome, Firefox, Safari, Internet Explorer and Edge. With the perfect font type, size, spaces, and contrast, Influencer makes sure that your content is easy on the eye and your visitors enjoy reading what you have to say. Don’t let the language barrier come between you and your website. Influencer theme supports localization so that you can use the theme in your local language. Do you use right-to-left (RTL) scripts like Arabic? Well, worry not! Influencer supports both LTR and RTL languages. You can write content with confidence! You can easily add your own logo on your website using Influencer theme. Want to modify some CSS effects or change color of a section? Influencer allows you to easily add CSS effects right from the customizer.